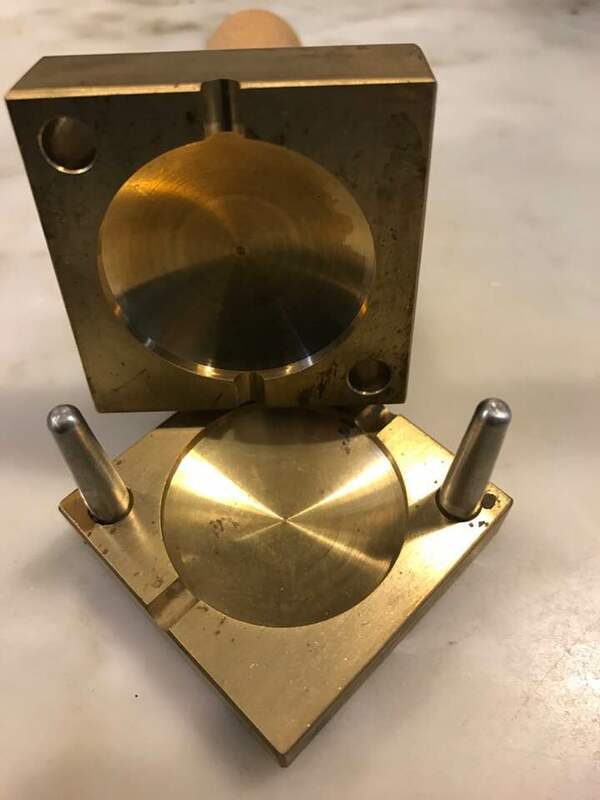 Brass Bead Press with two sizes in one. 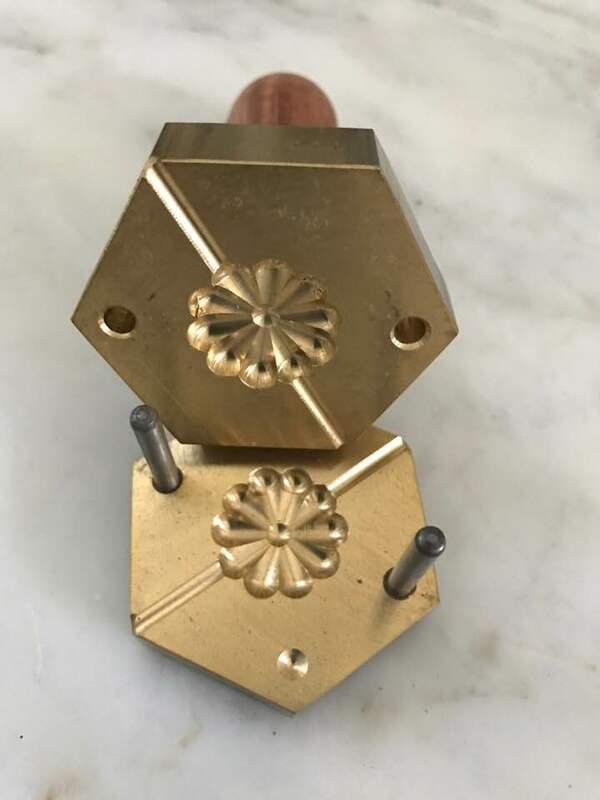 Quality solid brass, with woodern handle, has mold shapes: #Large mold is 38mm x 22mm and 7 mm total thickness. 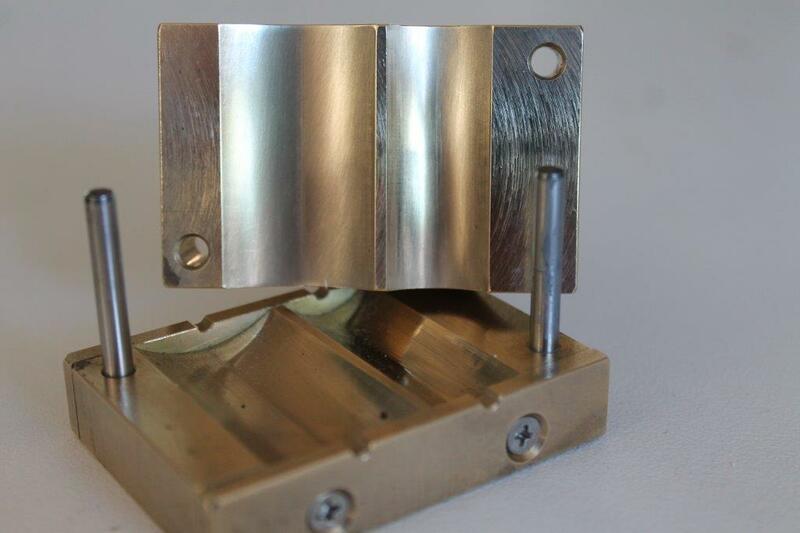 #Smaller mold is 38mm x 15mm and 7 mm total thickness. These sizes both make beads 38mm long and are similar to a slightly 'flattened' tube or pillow shape. There are grooves machined for fitting 1.6mm mandrels in the bottom plate. You will make uniform size beads and reduce your time spent on shaping a bead in the flame. It is just the perfect surface on which to apply a detailed design. This shape also makes a perfect pendant! Out of stock...Quality solid brass has mold shape, with a wood handle for forming Petal Shape lampwork bead designs and while reducing the time spent on shaping a bead. It is just the perfect surface on which to apply a detailed design. This shape also makes a perfect pendant! 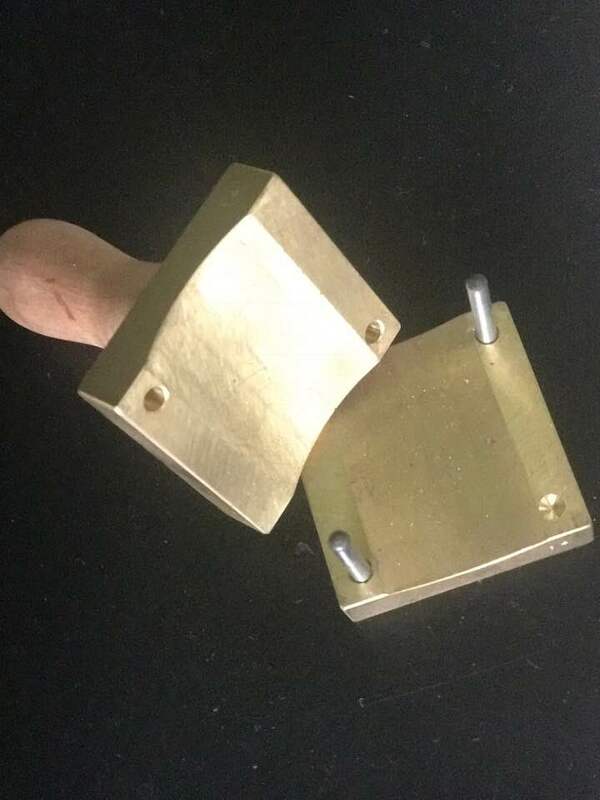 A quality brass bead press 50mm length x 33mm width x 5mm height, makes a beautiful concave/cushion glass pendant shape which reduces the time spent on shaping the glass. As it has a large flatish surface area it is just the perfect surface on which to apply a detailed design. An ideal shape for perfect pendants every time. Osibin Multi Groove Shaper This is a useful graphite tool with four V shaped grooves at 90º,each one has a different depth. How too: Shape the glass on or off the mandrel, then align along or perpendicular to the grooves to create the shape required. 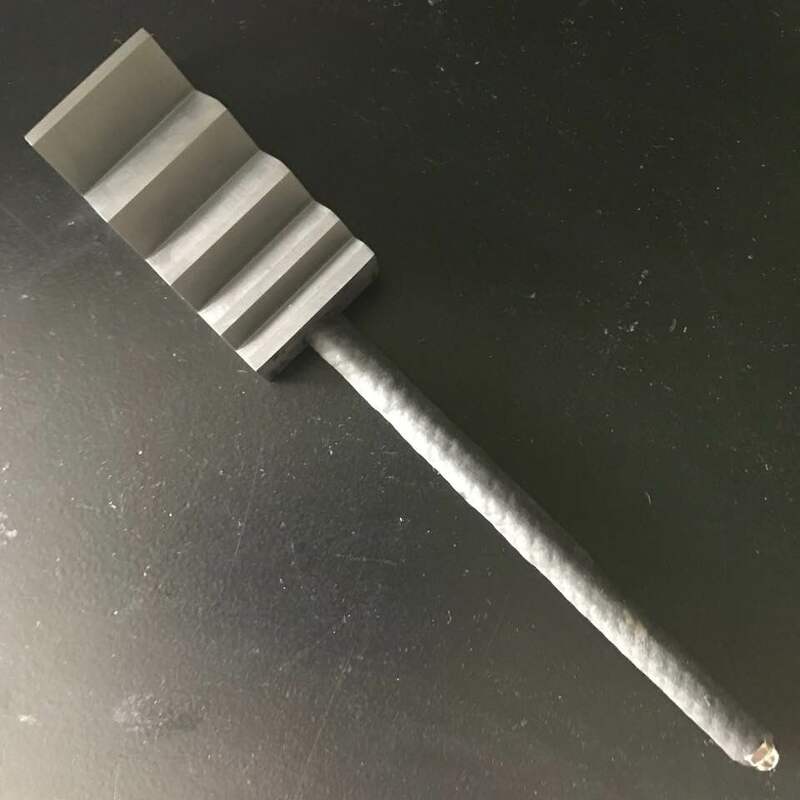 Used for making cones, bi-cones, vessels and many other uses. Back in stock 7.1.19.. This is one of the best shapers around. Two sided six slot disk shaper. Flexible design allows for both shallow/smaller beads and deeper/larger beads on the reverse.The first side of this marver measures 3/8" deep. These 3/8"depressions will create beads, that will measure 2 x 3/8"plus the width of your mandrel . Eg, using an 1/8 inch mandrel would produce a 7/8" disk bead (3/8" + 3/8" + 1/8"). This second set of slots is cut ¼" deep. These ¼" depressions will create beads, that will measure 2 x ¼"plus the width of your mandrel. Eg. using an 1/8" mandrel would create a 5/8" bead (¼"+¼" + 1/8"). The slots are still 3/8" wide. SMALL SIZE: 13mm wide x 35mm lth x 6mm ht. 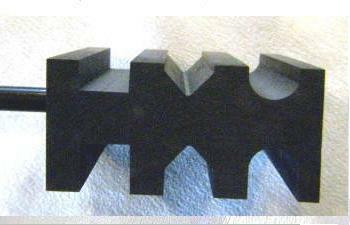 MEDIUM SIZE: 20mm wide x 35mm lth x 6mm ht. Quality solid brass,forms uniform lampwork bead shapes. These make beads similar to a pillow shape,and while reducing the time spent on shaping a bead it is just the perfect surface on which to apply a detailed design. 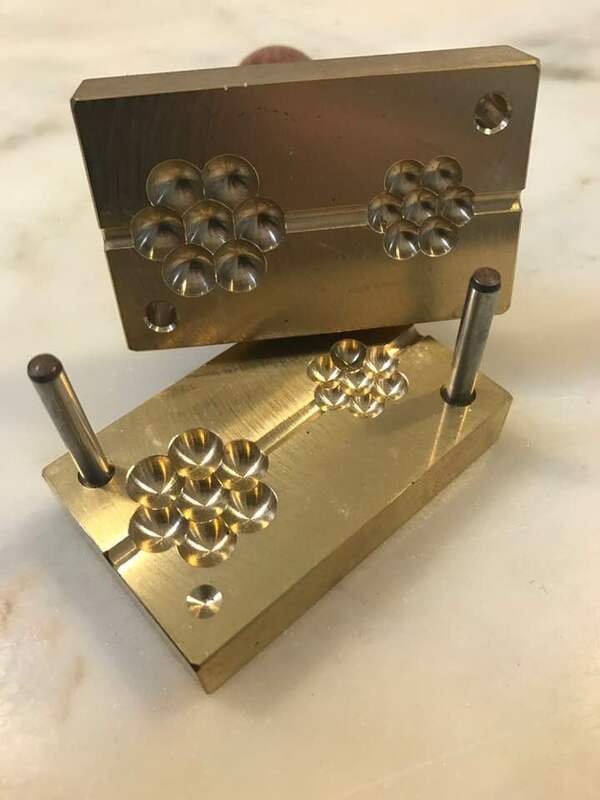 This graphite Marble Mold will make two sizes, a 5/8" or 15.87mm completely spherical marble as well as a 3/4"or 19mm completely spherical marble. 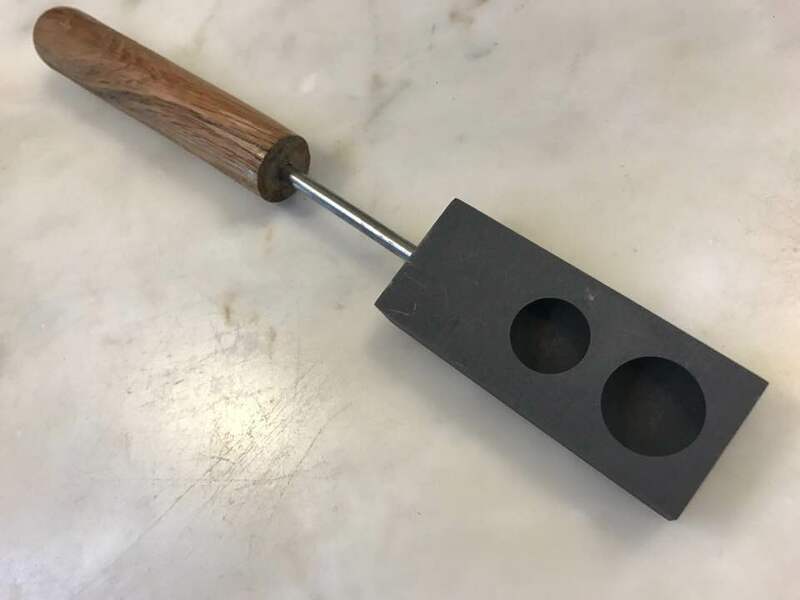 Tool has a woodern handle. (Out of stock) Quality solid brass mold has a straight side,38mm diameter, circular lentil,with a wood handle.It creates a lentil that is 20mm thick. Bottom plate has a groove for mandrels up to 3.2 mm. 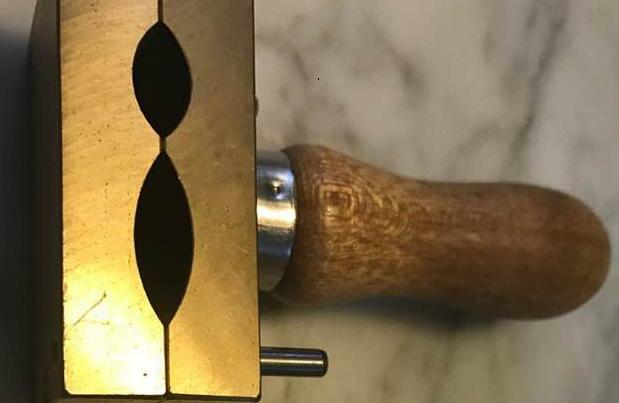 Reduces the time spent on shaping a bead. The perfect surface on which to apply a detailed design. These look beautiful in a lariat design necklace mixed in with various colours or as a pendant! One left!..Two sizes in one mold. Larger mold is 22mm diameter,and creates a Berry Bead 10mm thick..... Smaller mold is 15mm diameter,and creates a Berry Bead 8mm thick....... Quality solid brass has mold shape, with a wood handle for forming Berry Cluster Shapes in lampwork bead designs. 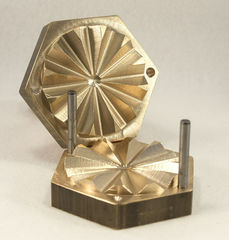 Grooved in bottom plate for mandrel 1.6mm. These look beautiful in a lariat design necklace mixed in with various colours!